Ask Ferzad Palia anything about his work and the replies are quick. Ask him something about himself and he says: "Now, you're making me think." Palia leads English entertainment channels - VH1 and Comedy Central - at Viacom 18. Although just 34, he is a veteran in the media and entertainment industry with 16 years of experience. "I have put in my years," he says when asked about achieving a lot at a young age. 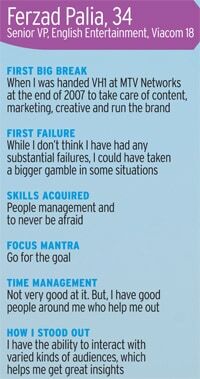 Palias first job was with ad agency JWTs marketing wing HTA Direct, where he also simultaneously completed his MBA on the insistence of his boss. He recalls that on the second day of his job, his boss asked him to release a nationwide print campaign in 18 languages. "I was thrown into the deepest end of the ocean, not even the pool," he says. "Thankfully, it all turned out right. It was the best way to start working." Palia says the toughest time in his career came in 2007 when he had decided to leave MTV Networks (now Viacom 18) to join another company but later backed out when he was chosen to head VH1, the music channel that was launched in India two years before. He says his ability to lead VH1 came under intense scrutiny initially, but he managed to gain the top managements confidence after doubling the channels revenue between 2010 and 2012. VH1 is now a highly profitable channel, thanks to the growing demand for English language channels in smaller cities, he says. After the success at VH1, he started conceptualising the launch of Comedy Central in India. The channel completed two years in India in January. "The whole of last year has been about investing in Comedy Central. It's done extremely well, much better than we expected." Maintaining profitability at VH1 and growing Comedy Central are high on his priority list. "It is an exciting and, at the same time, scary time, because the markets are not at their best."